PICTURES FOR YOU FIRST MAGAZINE AT ABERDEEN BUS DEPOT. PICTURE SHOWS DRIVERS ANDREW BALLANTYNE (LEFT) AND SHANE MITCHELL (RIGHT) BEING PRESENTED WITH COMMEMORATIVE BATONS BY ABERDEEN MD DAVID PHILLIPS (CENTRE)AFTER THEY RAN IN THE COMMONWEALTH GAMES RELAY. When Andrew Ballantyne and Shane Mitchell were called into their boss’s office, they thought they were in trouble. 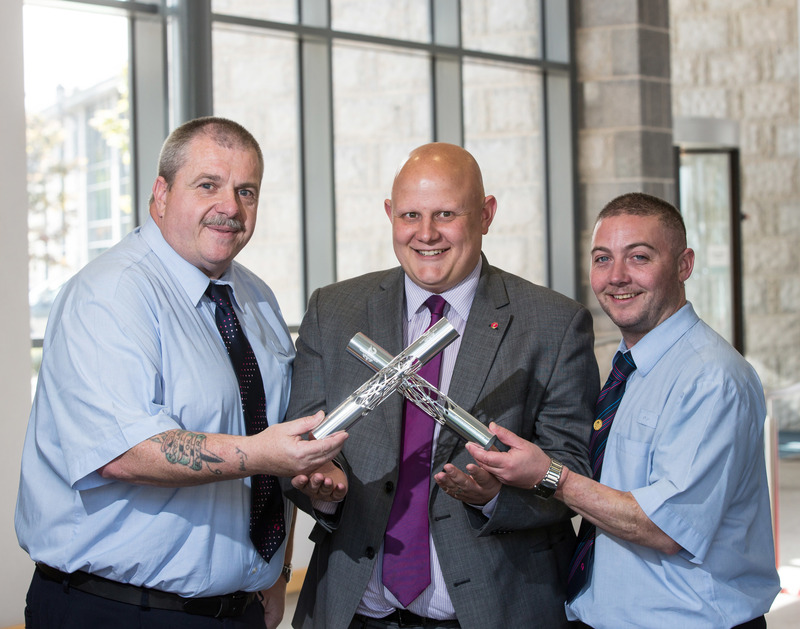 So the two bus drivers were thrilled and relieved to be presented with commemorative batons in a surprise ceremony. The pair, who work for First Aberdeen, served as Commonwealth Games baton bearers last year, taking part in the city leg of the nationwide relay. It was only through a chance discussion with a colleague that their new managing director David Phillips discovered they had not received a memento of the occasion, so he arranged for the commemorative batons to be made so the pair had a souvenir to mark the once-in-a-lifetime event. Mr Mitchell, 39, from Aberdeen, who has been a driver with First for four years, said he was worried when his boss called him in to talk. He said: “I had no idea what it was about and my stomach was churning. I honestly thought I was in some sort of trouble. “When Andrew and I walked into reception, David said ‘here you go boys, these are for you. Congratulations, they’re very well deserved’ and handed each of us a box. Mr Ballantyne, 56, who is also from the city, added: “Being one of the Queen’s Baton’s Relay baton bearers was a huge honour and now I’ve got a permanent reminder of an amazing day. Mr Phillips, who took over at First Aberdeen earlier this year, said he was happy to acknowledge the pair’s efforts.